The Fulbright Scholar Program funds up to 12 months of lectureship, post-doctoral research, or a combination of the two at a U.S. college or university with one fully covered dependent. Persons selected are expected to share information about Pakistani society and culture with students, colleagues and community groups in the U.S. On returning to Pakistan, Fulbright scholars are expected to make a significant contribution to Pakistan's development and share their U.S. experiences with students, colleagues and community groups in Pakistan. The grant funds airfare, an incidental research allowance, a living stipend and health insurance. USEFP will assist with visa application process. Persons with a dual U.S./Pakistan nationality or who have a spouse, fiancÃ©, parent or child over 18 year of age who is U.S. citizen or permanent resident. 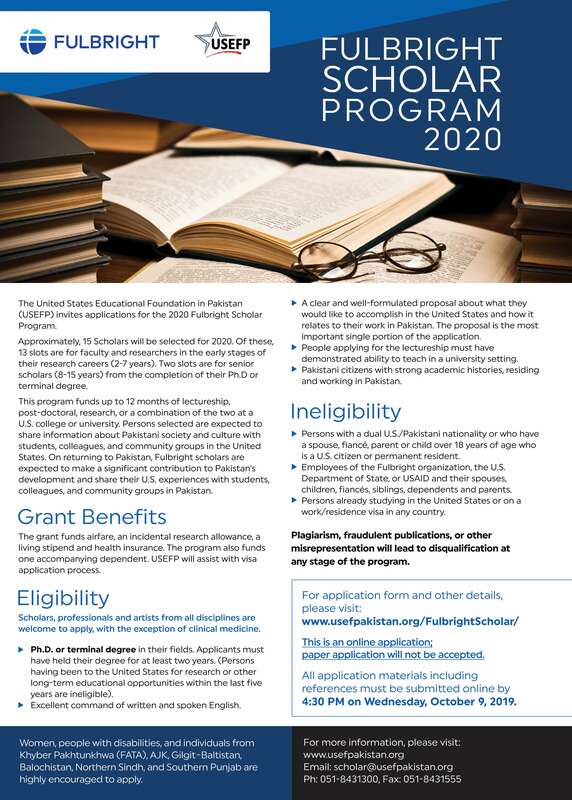 Who can apply for the Fulbright Scholar Program? Scholars, professionals and artists from all disciplines are welcome to apply, with the exception of clinical medicine. Every applicant must either hold a PhD or terminal degree in his/her field, or be a distinguished leader in his/her field. Successful candidates will have an excellent command over written and spoken English. Does this program require any English proficiency test? What contains in an application for the Fulbright Scholar Program? The application must contain a clear and well formulated proposal about what they would like to accomplish in the U.S. and how it relates to their work in Pakistan. The proposal is the most important single portion of the application. Do I need to have an invitation letter from the U.S. universities? To apply for this program one needs to have at least two invitation letters from the U.S. universities and they can be submitted either at the time of applying or after one has been shortlisted for the grant. There are no restrictions on accompanying dependents. Fulbright Scholar Program also supports and covers funding for only one accompanying dependents and the rest of the dependents are the scholar's responsibility. There is no "formula" for a successful grant application. Each individual's application should be about the candidate, how the grant time will be spent, and what outcomes can be reasonably expected. What is successful for one applicant may not be effective for another applicant. While it is useful to have someone with a known reputation in the field, the best criteria for recommendations is someone who knows your work and character extensively. You may also contact a professional reference who knows you well. The grant funds airfare, an incidental research allowance, a living stipend and health insurance. The program also funds one accompanying dependent. USEFP will assist with the visa application process. Who is ineligible for the Fulbright Scholar Program? Persons who have completed their PhD within the last two years or who have been to the U.S. for research or other long-term educational opportunities within the last five years are ineligible. Also ineligible are the persons with a dual U.S./Pakistan nationality or who have a spouse, fiancÃ©, parent or child over 18 years of age who is a U.S. citizen or permanent resident. Employees of the Fulbright organization or the U.S. State Department are ineligible.